Usually the pelargonium / geranium seeds are planted in January/February in order to start new plants in spring, when the winter freeze will be over. Pelargoniums / geraniums plants grown from seeds often outperform the varieties propagated from cuttings and posses excellent disease resistance and vigor properties and can tolerate high temperatures. Growing them is not so tough, but you need to be patient as they take few months to mature and bloom (flowering occurs 12 -16 weeks after sowing). I decide to plant pelargonium seeds now because their germination it is a slow germination process. 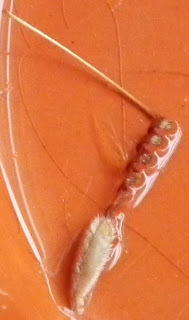 The coat of pelargonium seeds is impermeable to water and/or oxygen and if you want to have a 90-100% percent germination within two weeks after sowing, it is recommended to remove a small amount of the seed coat (scarification technique). 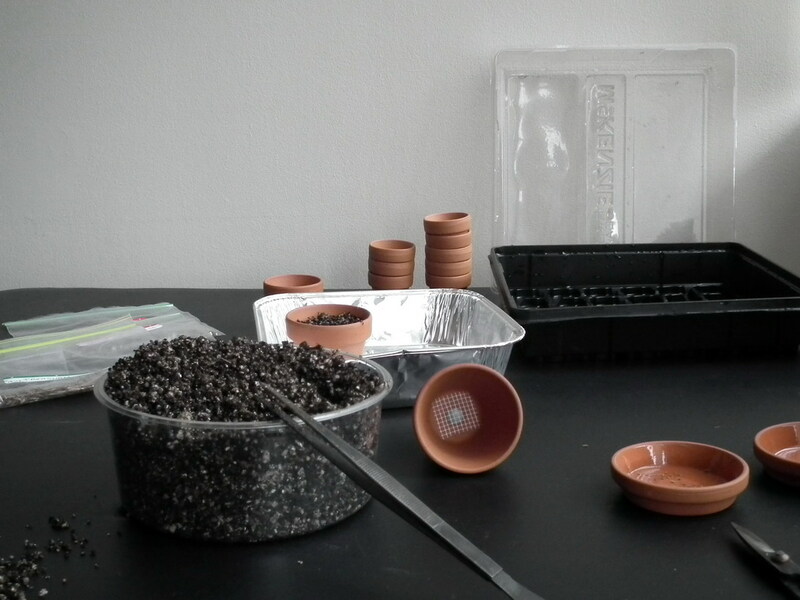 Non-scarified seeds had a half percent of germination in the same time, but for me is more reliable. Mechanical scarification could be accomplished by cutting a small piece from seed - and I'm afraid to do it. The scarification using acids is not exactly what I'm looking for, because I'm trying to eliminate the chemicals usage for my plants. Usually the seeds commercially available are scarified with one of these methods, but I gather myself the seeds from my garden and as I already told you, I'll plant them non scarified. This was on my "to do" list for these days. 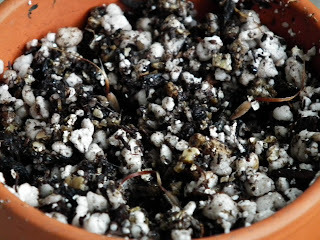 I prepared a starter mix soil with equal amounts of peat moss, vermiculite and perlite. I checked the soil PH to make sure the peat moss haven't made it too acid - and I added a bit of lime to increase PH level (ideal is somewhere between 6.5 - 7.5). 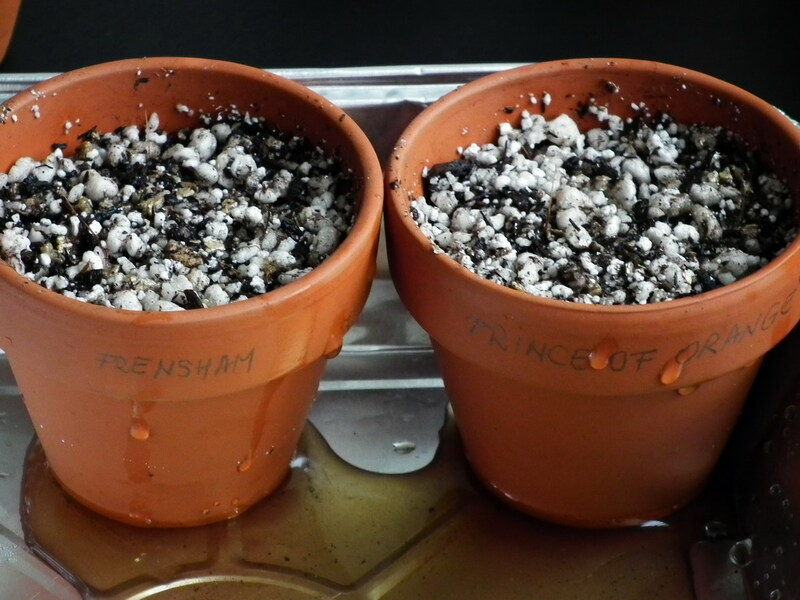 I filled the containers with germination medium to within 1 cm of the top, slightly firmed with my fingers. I watered the soil with very hot water (the peat moss is re-sterilized and absorbs the moisture), then I allowed it to drain for several hours. Separate, I soak seeds for 24 hours to start them to germinate. 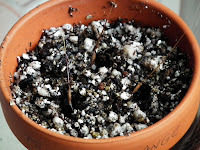 I sowed the seeds in drained germinating mix and covered them (few millimeters) I prefer to plant just 3 seeds in each container to avoid transplantation issues. 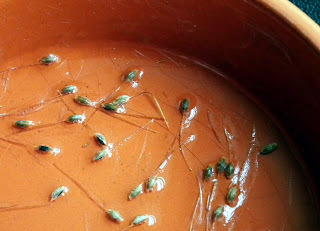 After sowing, I watered them thoroughly by partially submersing the containers in water until the surface becomes wet. I removed the containers from the water and allowed them to drain then I put the pots in a plastic dome (a plastic seed tray covered with a plastic lid) to be sure that I maintain a uniform moisture level throughout the germination period. I will eliminate this plastic dome when the first saplings will appear (perhaps 3-4 weeks) and I will place them under a fluorescent light or near a sunny window (12 hours daily). All this period I will keep them indoor at an average 20 degrees Celsius. Germinating scented pelargonium seeds in plastic dome. A serious problem, that can destroy the seeds during germination and the young plants, is damping-off, which is caused by various types of fungi. 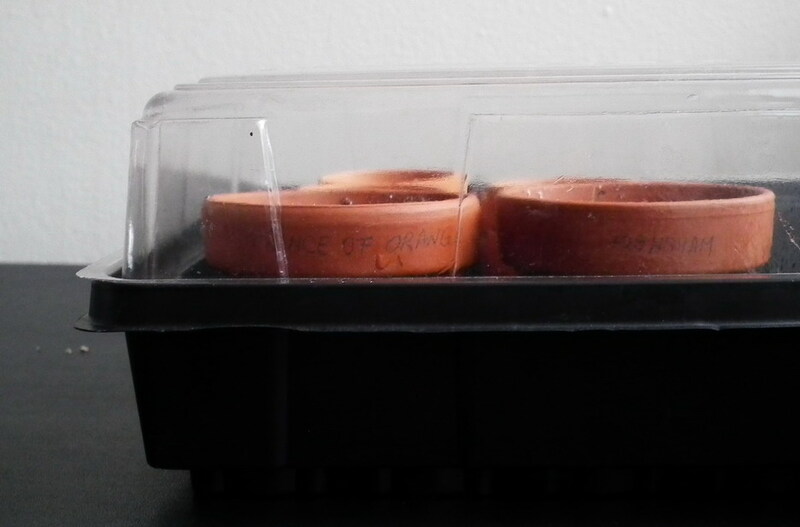 To discourage damping-off, I use new containers for starting seeds, which have adequate drainage (previously used containers should be washed well and disinfected). 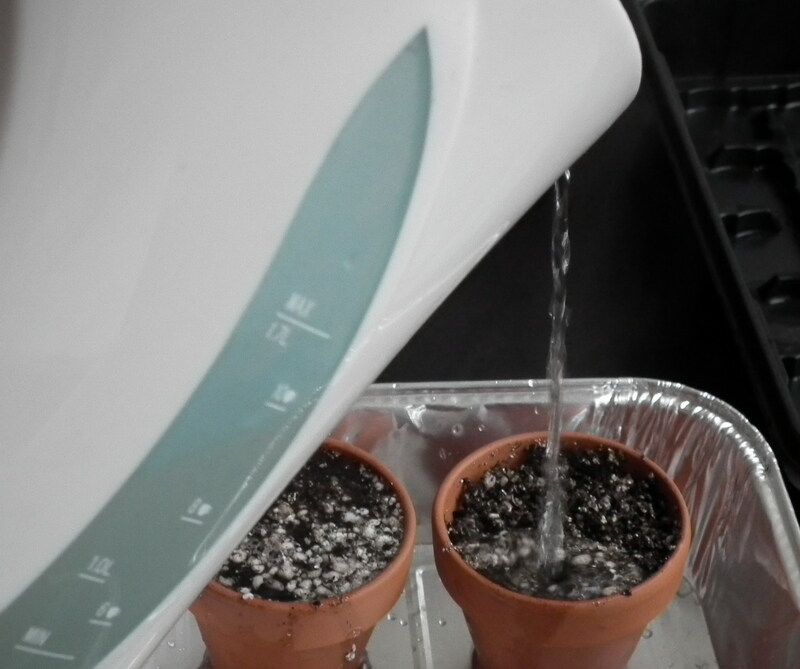 I added Hydrogen peroxide (diluted) to the water and when I soaked the seeds and the pots - it is very useful in control mold and fungus on plants and in the soil. Well done! 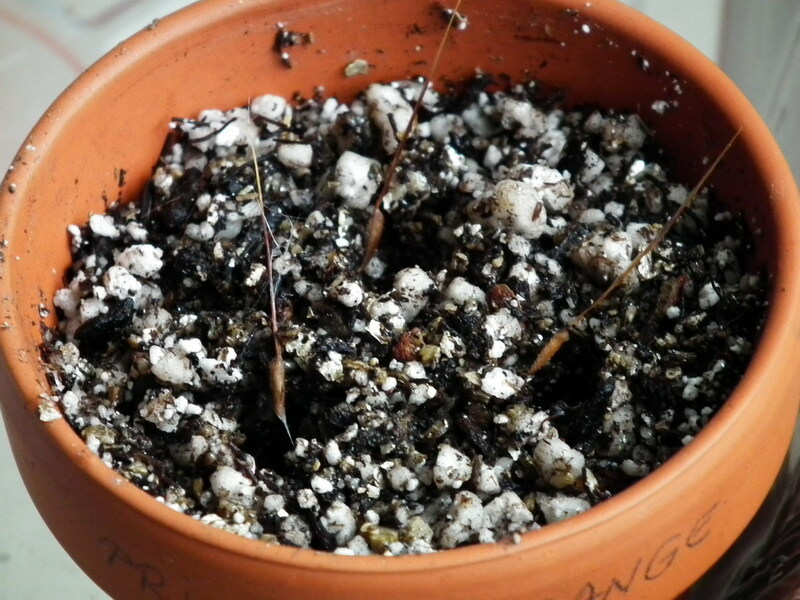 I will make another post about them once the seeds would germinate and the saplings will show first true set of leaves. I admire your ability to prepare these seeds and see the project through-- I'm afraid I loose focus and/or forget to water them. But I'm always so impressed when I see other who are successful at it. 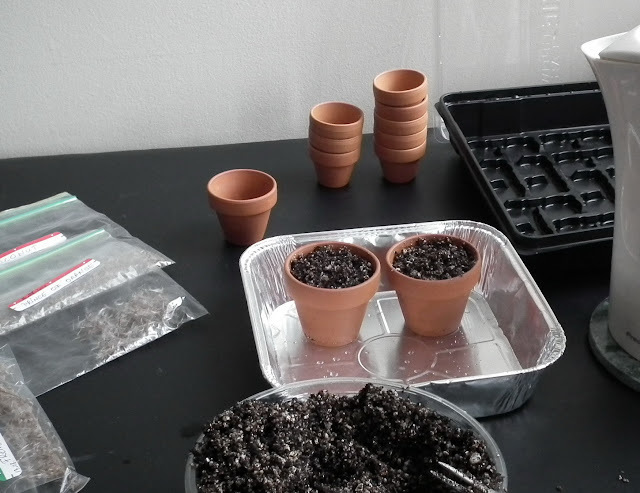 Seed starting is not something I have a lot of experience with, but something I definitely need to do, and learn to do better. I agree with JJ, it's impressive to see how you go about it and the results you get. That's all new info to me as well, I'm looking forward to seeing future posts and how they turn out!